Buy USDA Choice or, even better, Prime beef. It will be juicier and more tender than lesser grades. Remove the rack of rib bones, then tie it back on with twine. Cooking the roast with the ribs tied on makes it more tender and juicy. Preheat the oven to 200°F. Rub the salt and pepper over all sides of the roast. Place the roast, bone-side down, on a rack in a roasting pan. Bake in the lower third of the oven for 3 to 3 1/2 hours (25 to 30 minutes per pound) for medium rare (120° to 130°F), but test for doneness about 20 minutes before you expect the roast to be done. Let rest for 10 minutes before carving. Cut the twine and remove the bone rack. 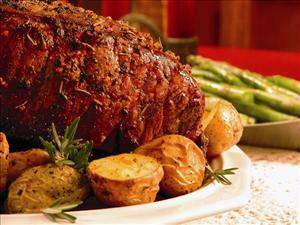 Turn the roast fat side up and cut into 1/2-inch slices. In a large skillet, heat 2 tablespoons of the oil over medium-high heat. Saute the mushrooms until nicely browned, then set them aside. Heat the remaining 2 tablespoons vegetable oil over medium heat in the skillet. Saute the onion until soft but not browned, about 5 minutes. Stir in the paprikas, bay leaf, thyme and celery seed, and cook for 1 minute. Stir in mushrooms, tomato paste and all but ¼ cup of the beef broth. Bring to a boil, reduce to a simmer, cover, and cook for 10 minutes. Place the ¼ cup reserved beef broth and the flour into a small screw-top jar and shake vigorously. Whisk the flour mixture into the pan and whisk for a minute or two. Simmer for 5 minutes. Stir in the sour cream, keeping mixture at a bare simmer. Add salt and pepper. Just before serving, add the beef, and heat for 1 minute.